The Pros and cons of this Sportstech SX400 Exercise Bike. This Sportstech Professional Indoor Cycle SX400 is a smart system that doesn’t sacrifice a great build for clever tech. 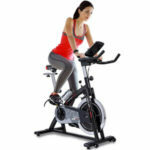 One of the obvious benefits of this spinning bike is the way that Sportstech have furthered the design of an indoor bike with smart technology. This all starts with that high-quality console that sits between the handlebars. Here riders can keep track of their progress via interesting programmes. 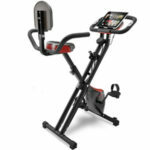 The Sportstech exercise bike is also app-compatible. Users can put their tablet in the designated holder, set up the fin iBiking app and enhance their experience. Furthermore, there is a pulse belt in the kit to help with heart rate training and improve conditioning while riding. This doesn’t mean that the designers have forgotten about the fundamentals in the build of the exercise bike. Beyond that impressive-sounding flywheel, there is a strong base, anti-slip pedals, an ergonomic shape to the frame and lots of padding. The quality of the armrest and the addition of the water bottle should add to user comfort levels. 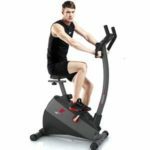 There are lots of interesting features in this Sportstech SX400 High-tech Spinning Bike, but they come at a price. There isn’t much that users have to say in criticism of this product. There will be those that question the worth of the spinning bike. There is a hefty price tag here because of the quality of the parts, the smart tech and the little details. There is a division of opinion between those that say it is worth every penny and those that feel that could get something better for less. The tipping point can be the app. Those that struggle with the features and connections will lose out on a major part of this system. What does this mean for a final verdict on this Sportstech SX400 App-Compatible Speedbike? This is an expensive bike. However, many users will be happy with what they receive – especially those looking for a more high-tech, interesting workout. The manufacturers have taken great care to balance that smart experience with enough features for at-home use. The bike machine is able to push users further than the average machine, but it is still user-friendly. 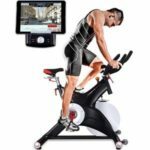 As a result, this Sportstech exercise bike is recommendable for all those that want to increase their efforts and try something new. 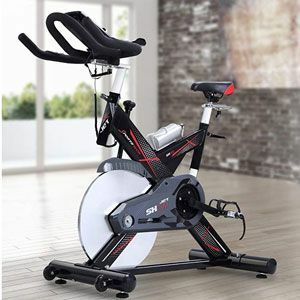 Find more reviews about the Sportstech SX400 Indoor Cycle on Amazon here.